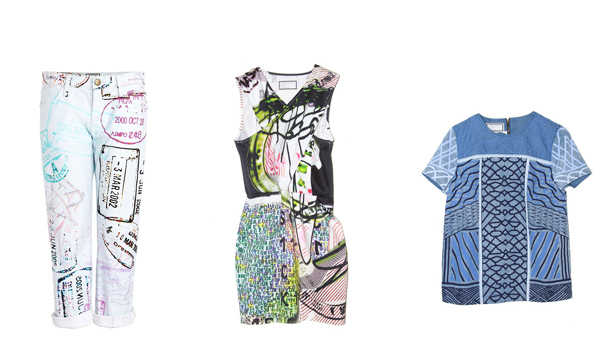 Finally the highly-anticipated collection of Mary Katrantzou for Current/Elliott was revealed yesterday on my-wardrobedotcom. The collaboration was announced back in September and now we have a chance to shop for the hottest garments online. 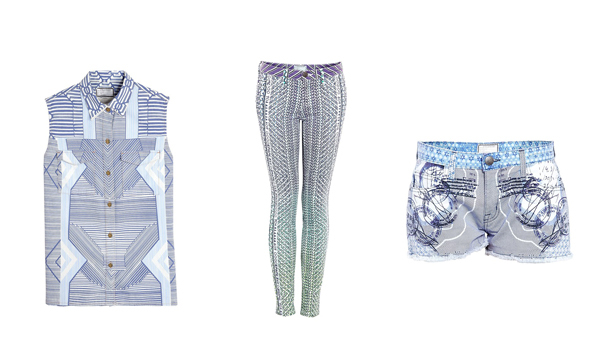 This womenswear range inspired by Katrantzou’s Spring Summer 2013 collection includes nine garments that come with the budget-friendly price tag. The collection includes dresses, skinny jeans, shorts and tops that feature Katrantzou’s signature prints like postage stamps and bank notes. My favorites in this Mary Katrantzou for Current/Elliott collection are the Apollo dress, Past skirt with bold prints and Bearding panel tee. While the dress is lightweight, chic and comfy, the skirt and the tee are versatile garments every girl should have in her wardrobe to create the effortless summer looks. As for the cost, you can buy the dress for $785 and a blouse for $355. The prices are not low comparing to the major part of the high street brands, however the prices in Katrantzou’s own clothing line start at a thousand dollars. For Current/Elliott, we looked at stamped visas and passports. In our last show, a critic mentioned denim and what it might look like with our prints and we thought that it could be a great challenge to work with denim for the first time. I really like what Current/Elliott does, so I approached Serge [Azria, the label’s creative director], with an idea for a collaboration. Current/Elliott became a highly-recognized fashion brand since its launch back in 2008. Under the direction of Azria, the label acquired a status of popular clothing brand that offers a myriad of excellent vintage-inspired garments. Mary Katrantzou is the must-have print designer of the moment, and this collaboration with Current/Elliott opens her designs to a wider customer. 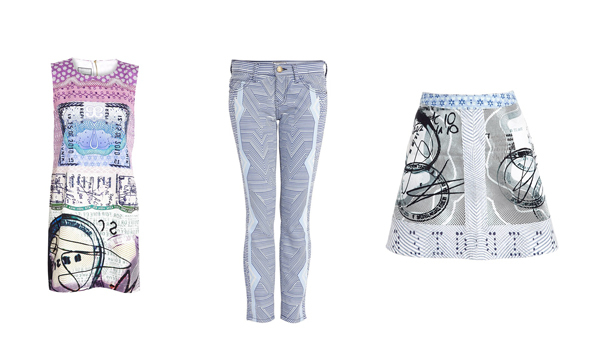 The unexpected mix of art-house prints on denim makes the collection wearable and undeniably urban with a cool edge. This collection promises to have a financial success since the fans of both brands couldn’t wait for its launch.